Absolutely gorgeous piece printed in a steely blue with an ochre rim and lovely moulded side handles. Actually the stand for a soup tureen but a lovely piece on its own. Backstamp: Blue printed anchor. Superb condition. This small dish or sauce tureen stand has an ochre rim and may be much earlier than 1895. It is the Adams pattern and shape and there is a printed blue anchor on the back, which is a rare Adams backstamp. Lovely condition. Absolutely delightful sauce tureen complete with cover and ladle by Wm Adams & Co. There is a small restoration to one tip of the finial and a tiny nick on the rim of the spoon cut-out, but the overall condition is superb. All bright and clean. It is rare to find the ladle. Blue printed cartouche backstamp with initials WA&Co and Ironstone, in use 1896 to 1917. This is the stand for Adams lovely octagonal footed bowl, but is a lovely piece in its own right. Backstamp: Rd no. 623294. This pattern was introduced by William Adams ..... Wm Adams. There is a little wear to the inner and outer rim and one or two lines of crazing otherwise excellent. Fabulous large octagonal stand for the large soup tureen, but a lovely piece on its own. Backstamp: Rd No. ..3294 This Pattern was introduced by William Adams in 1780 being a copy of a Chinese pattern & one of the first of its style produced in English Pottery Wm Adams. A little light crazing and the occasional minor manufacturing blemish and part of the border pattern is a little blurred, overall excellent condition. Small stand possibly from the sauce tureen or sauce boat.Pretty wavy rim with moulded side handles. A little light crazing visible mainly from underneath. This is a fabulous large tureen. Octagonal with two ornate side handles and central finial to the cover. Excellent condition. The ultimate for any collection: the large soup tureen complete with stand/under tray and the ladle. The cover has crazed glaze and a tiny rub to the finial. The ladle has crazed glaze and some light staining to the back of the bowl. The tureen is sound with no damage nor crazing to the glaze. The stand/under tray has a nick on one point of the rim, crazing to the glaze and underneath the odd patch of associated staining. Overall you have the complete set with no damage, a few signs of age and this is about as good as it gets. An absolutely magnificent set and stunning centre piece whether you collect this pattern or not. Lovely large tureen on a pretty wavy rim foot with pattern either side of the body. Inside there is a lovely rural scene inside to the base with the floral border around the rim. The cover is beautifully patterned all over. It is not an exact fit probably due to the wavy rim of both tureen and lid. A little light crazing to the base otherwise excellent. No stand but the 12.75 ins meat dish makes a good substitute. Blue printed backstamp. A really lovely tureen complete with ladle. The tureen stands on a pretty wavy rim foot with pattern either side of the body. Inside there is a lovely rural scene inside to the base with the floral border around the rim. It has just a touch of crazing. The ladle also has floral border around the inside rim surrounding the rural scene and is in excellent condition. The cover is not an exact fit, but I guess that is thanks to its decorative wavy rim shape. It is in excellent condition. Blue printed mark on the tureen and ladle. This lovely little piece was actually the stand for a sauce tureen, but is a lovely little piece on its own. Superb condition. Absolutely magnificent, one of the finest soup tureens we have ever seen. This design goes under various names: Claude Lorraine, Lorraine, After Claude Lorraine, Scene after Claude Lorraine and sometimes Blue Claude. The maker was Benjamin Adams, one of the famous and numerous Adams family of potters, and he operated Greengates Pottery at Tunstall, Staffordshire from c1809 to 1820. The design is derived from the paintings of Claude Lorraine, who although born in Nancy, spent most of his life in Italy, where he studied and established a reputation as a landscape painter. Many of his paintings have similar features: groups of trees, a ruin or bridge, all backed by mountains and rivers. Port scenes were another favourite, painted in the same style. His work inspired patterns produced by Riley, Leeds, Wedgwood and at least one unknown maker, in addition to that by Adams. It is believed that Adams commissioned William Brookes, a noted freelance engraver to produce his Lorraine design. Brookes was working from c1800 to 1838, first at Tunstall and later at Burslem. He is known to have worked for Davenport and Wedgwood, as well as Adams. Certainly the engraving of Lorraine is of the finest quality. Benjamin Adams' production seems to have been consistently of a very high quality, with both the potting and printing displaying great skill and with the subtle use of shades of blue to create a calm, classical look to his wares. A full range of dinnerware, including dessert services, was produced in this design. 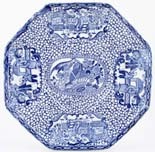 Plates may be found relatively often, but platters and the shapes, such as tureens, vegetable dishes and comports are now rare. This tureen is in excellent condition. The glaze to all three pieces is finely crazed. There is a chip to the inner rim of the cover. On the tureen there is a minor hairline on the rim and a firing crack from manufacture inside the base. On display it looks perfect. The glaze is bright and clean and the ensemble shines with quality. The stand and tureen have impressed backstamps B. Adams. Stand 14 x 11.75 ins 35.5 x 30 cm. A centre piece to grace any dining table, this is a stunning example of the sheer quality of the early 19th century master potter. Provenance: The Patricia Davies Collection. With gilt. Fabulous small tureen with stand, ladle and cover. Gorgeous ornate moulded details to the finial on the cover. Backstamp: Tedworth Crown Semi-Porcelain W Adams & Co England. The stand has the occasional very minor blemish. The lid has a tiny firing fault by the ladle cut out, the ladle and tureen are in excellent condition. 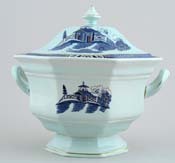 Small round sauce tureen stand with side handles, in the light blue Pearl design by Samuel Alcock & Co of Burslem, Staffordshire, active 1828-1859. Printed mark PEARL with beehive and Florentine China. Lovely condition. Large round soup tureen stand with side handles, in the light blue Pearl design by Samuel Alcock & Co of Burslem, Staffordshire, active 1828-1859. A knock and small old rim chip plus two small old chips to foot rim. Printed mark, PEARL with beehive and Florentine China. Little crazing, otherwise lovely condition. Also known as Number 6 pattern and made by Davenport. Lovely bird and floral pattern with added colour and an ochre rim. Complete set of tureen, stand, cover and ladle. Delightful moulded handles to stand, tureen and cover. Backstamp: Ashworth Bros Hanley England and in script pattern no. B9461. The stand has one or two minor blemishes otherwise excellent condition. The tureen and cover are in excellent condition. The ladle has light crazing otherwise also excellent. Overall a gorgeous set. Gorgeous tureen with stand and cover and fabulous ornate handles. Backstamp: Ashworth Bros Hanley England. The stand has a tiny tiny nick under one handle, cover has light all over crazing. The tureen is in excellent condition. With gilt. A fabulous large tureen, the cover having a ladle cut out and superb ornate side handles and handle to the cover. As seen on the Beasts table in the latest Beauty and The Beast Film! Backstamp: In gold script B 6630 and impressed 1 0(?) T in a random sequence. A little light crazing to the glaze inside on the bottom of the tureen, otherwise excellent condition. Pretty small stand in this popular series by John Denton Bagster. Vignette Series is a series of rural scenes and has a fabulous wide floral and scroll border and central vignette showing two cows. Blue printed backstamp complex cartouche with IDB and Vignette. Has had a hard life and has a crack and two under-rim chips. Fabulous small soup tureen with ornate side handles and finial. Backstamp: England and Registration mark for 1875. A little minor wear to the rim of the tureen and small minor firing fault to the finial, otherwise excellent condition. This is beautiful. An oval stand with ornate side handles and printed in a lovely soft blue. Backstamp: Bridge of Lucano. Light crazing, with a little wear on the back and a little to the outer rim, overall excellent condition. A joy to behold! Fabulous large round stand with pierced side handles. Backstamp: Asiatic Pheasants BH & Co. There is a little wear and minor discolouration to the outer rim, some bubbling of the glaze, a couple of manufacturing blemishes and a tiny hairline to the rim. Overall very good and a lovely piece, sounding much worse than it looks. Lovely large stand with moulded side handles for a round soup tureen, but a superb piece on its own. Backstamp: Asiatic Pheasants BH & Co. Crazed and there is a little loss of glaze to the stilt marks otherwise excellent condition. 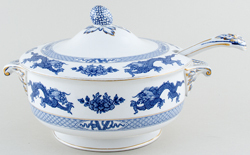 It is so difficult to find the complete sauce tureen set. This decorative example was probably assembled at some point in the past, but all fits together beautifully. The tureen and cover both have moulded loop handles and are in excellent condition. As always there are the occasional glaze blemishes, but the glaze is sound and they could not be brighter and cleaner. No maker's backstamp. The stand has two side grip handles and the glaze is very finely crazed, with two areas with a hint of staining, but these are hidden when the tureen is in place. Blue printed Asiatic Pheasants cartouche backstamp with B H & Co, which is usually attributed to Beech Hancock of Burslem 1851-55. The ladle is decorated down the handle, round and in the bowl. The glaze is crazed and stained, but there is no damage. A rare survivor. J & MP Bell Glasgow. This is absolutely gorgeous! A round tureen with gently moulded body rising to a wavy rim and standing on a shaped decorated foot. It has just a touch of crazing here and there is a very small chip to the inside rim not noticeable when the cover is in situ'. Not marked but definitely J & MP Bell. J and M P Bells famous Triumphal Car pattern on a lovely old soup tureen. Small area of light stain to stand, tiny restuck chip on spoon cutout, glaze is finely crazed, overall lovely condition. Stand has printed and impressed Bell marks. Delightful round tureen standing on an ornate decorated foot. Backstamp: Impressed TB. There is a little wear to the rim, handles and foot and a little discolouration inside, overall excellent condition. A wonderful name for a pattern! This is a lovely oval tureen with ladle printed in a steely blue/grey. the ladle has light crazing and a little wear around the rim, and there is a tiny tiny nick to the inside rim of the tureen otherwise fine. A most unusual pattern on this pretty little tureen. Stand and tureen have light crazing otherwise fine. Cover is absolutely fine. The print on one side of the tureen is hazy. With gilt. Lovely little tureen complete with gorgeous small ladle. Backstamp: Nankin printed above caduceus with Bisto England below and in script C 2576 L There is a little wear to the gilt on all pieces. Inside the tureen there are some manufacturing blemishes. The ladle has crazing with a few minor blemishes underneath. The cover has a little wear underneath. Overall a lovely set. A pretty little tureen decorated with floral swags. There is a little wear around the rim of the tureen and a tiny nick to the ladle cut out otherwise absolutely fine. 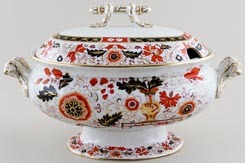 Oval tureen in the lovely floral Delph pattern. Stand and cover have light crazing otherwise excellent condition. Blue printed Blairs Delph Made In England. Pretty little round tureen with gently moulded body and pretty flower finial to the cover. Backstamp British Scenery Booths Silicon China England. The tureen has light all over crazing with a small chip to the inside rim and a couple of small glazing faults inside to the base and a little minor wear to the rim. The cover has a couple of minor blemishes otherwise is in excellent condition. Davenport originally made British Scenery from about 1850 and when they closed, Booths acquired the printing plates and continued producing the design in the same shade of steely blue. In excellent condition, virtually as new, although the glaze is crazed. Blue printed backstamp British Scenery over Booths and crown, with Silicon China and Made in England beneath. Impressed Booths and date marks for early 1930s. A large tureen with lovely rural scene either side and to the cover with a wonderful border of intertwined grapevine and wheat. Cover has cut out for a ladle. Made for soup, but great for large quantities of vegetable. There is just a little minor mottling to the rim othewise excellent condition. Blue printed Booths backstamp with A8025. This is a large and impressive piece and overall in superb condition. It has just a touch of very minor damage to the underside rim of the cover (not noticeable unless turned upside down! ), a hint of discolouration to the finial and a tiny flake of glaze missing off one side handles, otherwise magnificent! Cover has cut out for ladle. Blue printed backstamp: Booths British Scenery, Silicon China, England. With gilt. Gilt on the stand is worn otherwise in excellent condition. Impressed with date for May 1930. The tureen has had a knock to the rim which has resulted in a small unsprung chip (sounds worse than it looks! ), otherwise is fine. The cover has minor signs of wear to the gilt otherwise is excellent. Blue printed with added gilt decoration. Sauce tureen and cover are in fine condition but the ladle handle has been broken and restored. Suitable for display. With Gilt. Gilt a little worn around the rim of the cover, otherwise fine. With gilt. Fabulous large tureen with stand and cover. Backstamp: Booths Silicon China England also on stand impressed Booths. Stand is crazed with a little wear to the gilt otherwise excellent condition. The tureen has light all over crazing, two hairlines to the rim and a little wear to the gilt. The cover has a little wear to the gilt otherwise is in excellent condition. Overall a fabulous set. With gilt. Tureen complete with stand cover and ladle. Backstamp: Booths Silicon China Made in England, also on stand impressed Booths and date for 1929. There is some wear to the gilt on the stand and just a little to the stem of the ladle and underneath the cover two tiny tiny nicks. Overall excellent condition. With gilt. Pretty little tureen complete with ladle. It has an attractive finial to the cover surrounded by embossed and decorated leaf design. There is some wear to the gilt. The ladle has a little crazing and the transfer is just a little hazy in around the rim. Overall a lovely set. With gilt. Fabulous large tureen with ornate side handles and pine cone finial to the cover, with a large ladle with embossed detail to the tip of the stem highlighted with gilt. Backstamp: Booths Silicon China England and in script 9780. The tureen has light all over crazing with a little wear to the gilt and a little wear and discolouration to the rim. The ladle has a little minor smudging of the pattern and touch of wear to the stem, overall in excellent condition. The cover has some wear to the gilt otherwise excellent condition. Overall a wonderful set. With gilt. Very attractive dish in this very pretty floral pattern. Delightful little tureen complete with stand. Backstamp: Dresden TF & FB (for TG & F Booth)and printed and raised pad registration marks also on the stand impressed Ironstone TGB. The tureen has some brown mottling inside and a little discolouration to part of the rim. The cover has light crazing and a small hairline from the ladle cut out. The stand is in excellent condition. Printed in a lovely steely blue this tureen comes complete with ladle. The oval stand has light crazing with just a little light associated staining. The ladle has a little discolouration to the end of the stem and the cover has a tiny tiny nick to the corner of the ladle cut out. All in all a lovely set. A wonderful large tureen in this bold floral pattern. The cover has a ladle cut out. Backstamp:Indian Ornament TG & FB. Light crazing with a little wear and discolouration to the inner rim and also inside to the base. There is a small glazing fault to one handle and a very small area of restoration to the rim. Overall an impressive piece which sounds much worse than it looks. Very pretty tureen with stand and cover, printed in a steely blue. Backstamp: Booths Silicon China Lowestoft Deer with impressed Booths on the stand. The stand and tureen are crazed with a little discolouration. The cover has had a repair to the pine cone finial otherwise is in excellent condition. Pretty floral sauce tureen printed in a smoky blue. A most ornate finial to the cover and pretty moulded side handles to the tureen. Ladle has floral decoration inside the bowl. Stand which measures 8.75 ins x 6.25 ins is crazed and has some associated light staining. Tureen, cover and ladle all fine. Gorgeous set of tureen, stand, cover and ladle, all printed in a steely flow blue. Backstamp: Royal Semi-Porcelain Melsary Booths England and impressed Booths. The stand, tureen and cover have crazing with a little discolouration to the stand. The cover has a small chip to the rim by the ladle cut out. The ladle is in excellent condition. Overall a fabulous set. With gilt. Lovely set complete with stand and ladle all printed in a steely blue/grey. A little minor wear to the gilt. Blue printed backstamp crown over Royal Semi Porcelain, then Melsary, Booths, England. Impressed Booths. With gilt. Soup tureen, stand and cover. Stunning floral pattern highlighted with gilt and with gilt to the rim, side handles and central handle on the cover. Backstamp: Booths Silicon China England Oriental Tree, impressed Booths and Rd No510607. The stand is crazed with some discolouration. The tureen has a little crazing, some wear to the gilt and minor wear and a small chip to the inner rim (the latter not visible when the cover is in situ'). the cover has a small chip under the rim and a little wear to the gilt. Overall a stunning set.